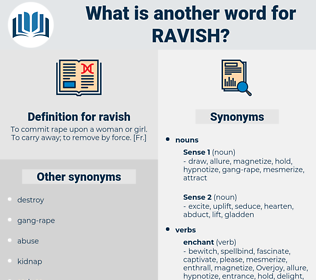 What is another word for ravish? going over with finetooth comb. disgust, depress, repulse, offend, repel, displease, turn off, disenchant. disillusion, respect, sustain, vindicate, applaud, tend, shield, benefit, conserve, extol, care for, favor, eulogize, Panegyrize, laud, uphold, regard, protect, praise, cherish, consider. There were pieces in verse that she could read, - things not wondrously good in themselves, - so that she would ravish you; and she would so look at you as she did it that you would hardly dare either to avert your eyes or to return her gaze. And as she stood With rigour in her nerves, a mighty shudder Ravish the light, and in the midst appeared Vision, a goddess, terrible and kind; And to the Queen the goddess spoke, in voice That healed her anger with its quietness. 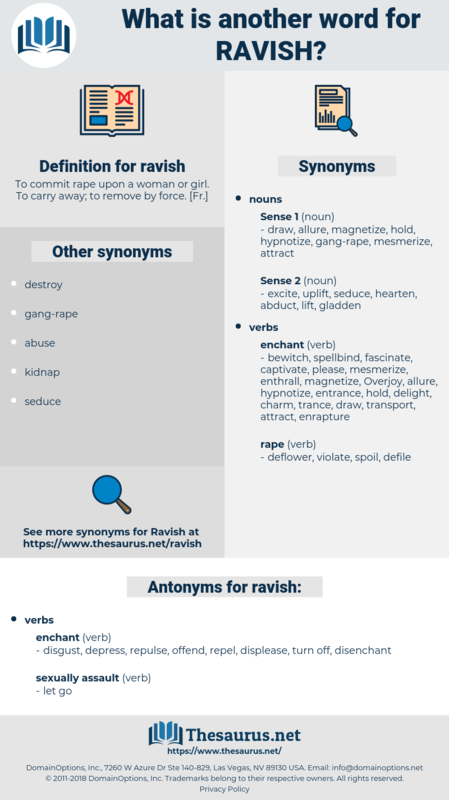 rhapis, ravehook, Rara Avis, ravage, rebecca, rubus, rabies, rebus, rubbishy, ripsaw, refugee, refocus, repose, rhibhus, revoke, refuse, raffish, reap hook, raphus, Rebozo, ribose, rubiaceae, repossess, refuge, ribes, Rubus Caesius, rib cage, rebuke, rubbish, revise, reface, ribhus, rooibos, rear back, rebekah, roof peak, repechage, roebuck, rapacious, rbc.